For three generations, the Raguénès-Plage Campsite has been offering visitors charming seaside camping holidays. 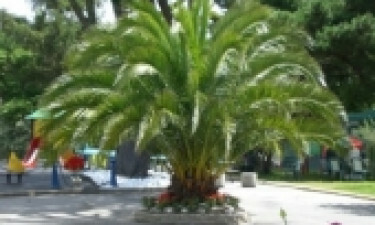 The motto of the family-run luxury camping site is "This is the spirit of camping by the sea". 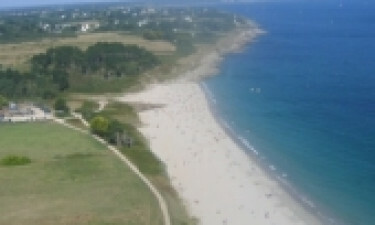 To find out more about the Raguénès-Plage Campsite, contact LUX-camp today! 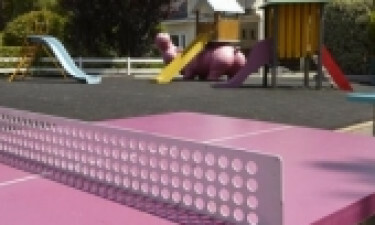 Why should I choose the Raguénès-Plage Campsite? When you book a holiday with LUX-camp, you can be sure of a luxury camping experience and the Raguénès-Plage Campsite certainly proves this to be true. There is a choice of luxurious camping accommodations, including fantastic mobile homes. All are equipped with everything you need for a comfortable stay - such as a kettle, a large fridge with a freezer section, a barbecue, outdoor furniture, heating and much more. Beds are made up ready on your arrival. The beach is only 300 metres from the campsite. You can walk to it across a field; there are no roads to cross making this site very child-friendly. The beach is a vast expanse of pale yellow sand, a typical Breton beach. The sand is the perfect consistency for digging sandcastles! At one end of the beach are rock pools just waiting to be explored, and a causeway that joins the island. Be careful not to linger when the tide turns as you could be cut off from the mainland! There are also lovely coastal walks from the campsite and plenty interesting places to visit nearby, such as the pretty towns of Quimper and Concarneau, which are about twenty minutes’ drive away. The nearest village is Nevez, which is full of charming little cafes, restaurants and gift shops. What to do on the Campsite? So much to do on the campsite! There are plenty of on-site activities for all ages at the Raguénès-Plage Campsite, so you definitely won't have time to be bored! There is a volleyball pitch and two trampolines. The pool complex is very impressive, there are four areas; an indoor pool with a paddling area suitable for toddlers, and two outdoor pools - one that is a traditional rectangular shape, and the other for smaller children with a mini slide. Finally, there are water slides going into a splash pool. All are kept impeccably clean and well-maintained. There are plenty of sun loungers surrounding the pools and there is also a sauna. The evening entertainment includes a weekly disco, and there is a bar and a games room. If you feel like a treat, you can book a massage or a session with a beautician.
. All are equipped with everything you need for a comfortable stay - such as a kettle, a large fridge with a freezer section, a barbecue, outdoor furniture, heating and much more. Beds are made up ready on your arrival. There is a small shop on the campsite which covers all the essentials: baked goods, fruit and veg, meat and dairy products, as well as mobile cards and post stamps. On site, there is a take away service and a restaurant offering a variety of delicious hot and cold meals. While the little ones wait for the food to come to the table, they can enjoy themselves on the playground with the parents watching over them.